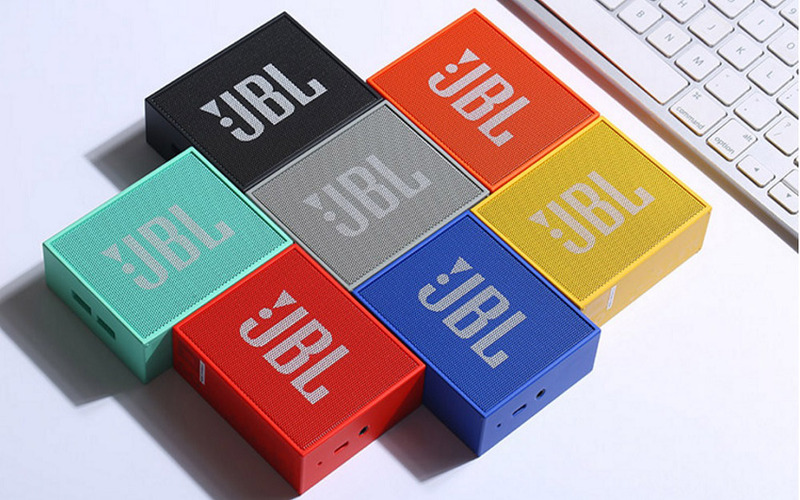 Featuring Bluetooth connectivity, the JBL Go Bluetooth speaker streams music from smartphones and tablets through wireless pairing, powered by a rechargeable battery with up to 5 hours of playtime. It features a convenient noise and echo cancelling microphone, allowing you to pick up calls without turning the speaker off. The JBL Go has a compact and light weight design, built-in strap-hook and optional carrying strap, allow you to bring your music everywhere. With a smooth and durable double-injection finishing, it provides exciting, eye-catching contrast wherever it goes and easily compliments anyone's style. The speaker has a range of buttons that let you adjust the volume and change the settings according to your preferences. Weights only 130 grams, excellent for those constantly on the move. Supports Bluetooth 4.1 up to a maximum diatance of 10 meters. Using the built-in HD microphone which with noise and echo cancellation to answer calls with the touch of a button. Uses high performance polymer batteries, providing up to 5 hours of continuous listening time. Can be used with smartphones, tablets, laptops, and music players via Bluetooth or AUX lines.